USC vs UCLA: WHY CHEAT TO GET INTO JUST ONE WHEN YOU CAN CHEAT TO GET INTO BOTH? With the announcement, last week, that 50 people, including actresses, Felicity Huffman (Desperate Housewives) and Lori Loughlin (Full House) were indicted as part of a conspiracy to defraud college admissions boards, in order to get their children into elite schools, it shined a light on not only the lengths that some affluent people will go in order to get their kids into school, but also, how much easier it must be to get into these schools through this manner than by doing something so much more difficult… studying. One of the schools targeted in this scandal was Los Angeles’ own University of Southern California, begging the question, is it really that hard to get into USC? Let’s find out. According to student-tutor.com, there are several requirements involved in getting accepted into USC. They are as follows: 1. Finish High School (seems fairly obvious, unless you were boy doctor, Doogie Howser, who skipped all of this because he was so smart) 2. Have 3 years of elective courses like computer science, art, speech or music, all courses that can help you get into college but almost ensure not getting a date in high school. 3. Receiving an average score of 1360 or higher on the SAT. I got a 1060, which would not have gotten me into USC but was more than enough to land me the opportunity to write this blog! 4. A high school Grade Point Average (GPA) of 3.75 or above. Mine was around a 3, but again, you’re reading this, so even if your GPA was higher, haha, I win. 5. Writing a great college essay. I wonder if I can use this to apply to USC now? Beyond those requirements, you have to do things like fill out all the admissions forms and send them in on time. Do all of these things and according to collegesimply.com, you have a 16% chance of actually getting accepted into USC, which puts the university in the category of Elite colleges. With this information, it makes it seem a little more understandable why Aunt Becky from Full House, would forgo all of the principles she showed while dealing with DJ and Stephanie Tanner. Oh, and yes, the Olson Twins were there too, but let’s face it, no one was going to teach them anything. According to court documents, Lori Loughlin and her husband, fashion designer, Mossimo Giannulli, (by the way, if you can correctly spell his name without looking it up multiple times, you should be allowed into any school in the country) paid a half a million dollars to a company that allegedly bribed college coaches and fixed entrance exams, in order to get their two daughters into USC. That begs the next question, why didn’t they just send their daughters to UCLA? Now, for those who live outside of Los Angeles, it might be a good time to explain the rivalry between USC and UCLA. Considering that in a laid-back city like Los Angeles the biggest rivalry you will usually find is the one between studio executives regarding who got the better parking spot on the lot, the decades long rivalry between USC and UCLA is fairly unique. Although USC was founded 39 years before UCLA, to many it feels like their contrasts and comparisons have existed forever. On it’s face, both schools are nearly equals. USC has a student body of 45,600 students, while UCLA has about 1600 less at 44,000. 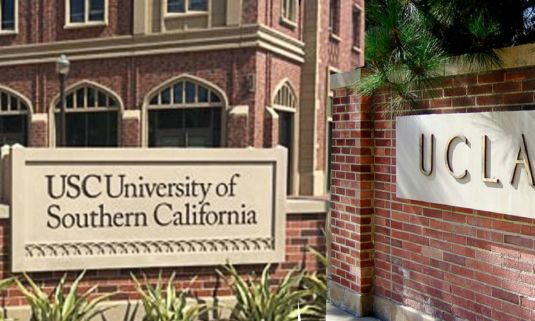 Both schools are in the elite category in regards to admissions, with USC, once again, admitting 16% of its applicants, while UCLA admits 16.1%.. As far as college rankings go, USC tops UCLA by being ranked 31st in the country, while UCLA is 37th. That is a 6 college difference for any of you reading this who didn’t go to college, but still pretty close. It’s way closer than where I went to college, the University of Miami, also known as Harvard on the Bay, which was ranked 81st. 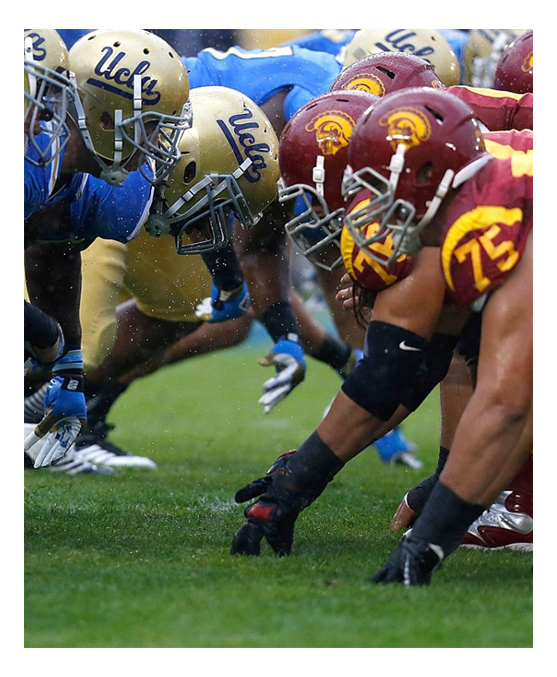 So, with all of these similarities, why are USC and UCLA so often at odds? The first place to look would be in famous alumni. UCLA’s impressive list of alumni include sports legends, Jackie Robinson, Kareen Abdul Jabbar, Arthur Ashe, Reggie Miller, and Bill Walton, movie and tv stars like James Dean, Ben Stiller, Carol Burnett, James Franco, Rob Reiner, Mayam Bialik, Marilyn Monroe, Mark Harmon, Arnold Schwarzenegger, George Takei and Urkel from Family Matters, to name a few. It also was the starting place for director, Francis Ford Coppola, composer, John Williams, Doors lead singer, Jim Morrison and Marcia Clark, who couldn’t convict OJ (who went to USC, although, for some reason, they never mention it). UCLA’s crosstown rival USC’s list of notable alumni include; first man on the moon, Neil Armstrong (played by Ryan Gosslin), Prime Minister of Japan, Shinzo Abe, actors, Tom Selleck, John Wayne, Will Ferrell, America Ferrera, Cybil Shepherd, Regina King, Forest Whitaker and many more who’s names were not as impressive as the ones included. It also was the breeding ground for famous directors George Lucas, Ron Howard, Robert Zemeckis and Judd Apatow, who combined have made more money than every other alumnus combined and at least 200 countries. So, when you add up all of the famous people that went to each school, it seems pretty close to a draw. Side note; Steven Spielberg’s grades in high school weren’t good enough to get into either of these schools, so he went to UC Long Beach, which makes that school infinitely cooler than the other two. With schools so steeped in college sports history, a natural reason for the crosstown rivalry would be in sports. Again there, when you match up the numbers, it’s a neck and neck race. According to the NCAA’s statistics UCLA ranks number 2 in the amount of Team National Championships with 117, while USC is right below it at number 3 with 108. Things change a bit when comparing college’s two biggest sports, Football and Basketball. When it comes to college football in Southern California, the clear winner is USC, who have captured 11 outright national championships, while UCLA only claimed one, back in 1954. In head to head match-ups, the 2 schools have met a total of 88 times or 6214 tailgates, with USC winning 47 of these games to UCLA’s 32. There were also 7 ties, which everyone knows is the equivalent to kissing your mother. With these always sold out games being played at either the Rose Bowl in Pasadena or the LA Coliseum, each game is witnessed by roughly 100,000 people in the stands, 99,999 of whom will complain about the traffic leaving the game. , In Basketball, it is total dominance for UCLA who has won 11 NCAA titles, while USC never made it beyond the Final Four (2 times). Add up all of the sports history and again, you’d have to conclude that they are pretty much equal. A final comparison of both schools leads us to probably the most important and definitive showdown, school mascots. For USC the mascot is a Trojan, which again for those who didn’t attend college, were the valiant and brave soldiers who defended the island city of Troy against Greece, during the Trojan War of the Bronze Age. UCLA’s mascot is the Bruin, which is a brown bear. Now comparing the 2 isn’t as easy as it sounds because there are no records of Trojans ever facing brown bears. That being said, in the 2004 film Troy, Eric Bana, who played Troy’s Prince Hector was defeated by Brad Pitt who played the Greek warrior, Achilles. According to IMDB Brad Pitt stands at 5 feet 11 inches, while Eric Bana is 6’2. With that in mind, lets take a male bruin or brown bear who can grow to about 10 feet and weigh 1200 pounds and put them up against Brad Pitt. Sure, in the movie, Brad had a sword, but the bruin sports 4-inch claws and a considerable height and weight advantage. If you had to guess, I think the bear take Brad, 8 out of 10 times, only loosing twice, because the bears were so dazzled with Brad’s good looks. Add all of this up and it’s fair to say that the Bruin will almost always best the Trojan. Ok, so none of this really explains why these two schools so dislike each other but psychology says that we often dislike things that remind us of ourselves, or maybe that was a Law and Order: SVU episode that said it. Regardless, getting into either school is a task for any student, whose parents were not on a network show. I guess the final answer is to work hard, study, get to know people and maybe, just maybe you’ll land that tv role that will pay you well enough to get your slow-witted kids into a good college. Just saying.